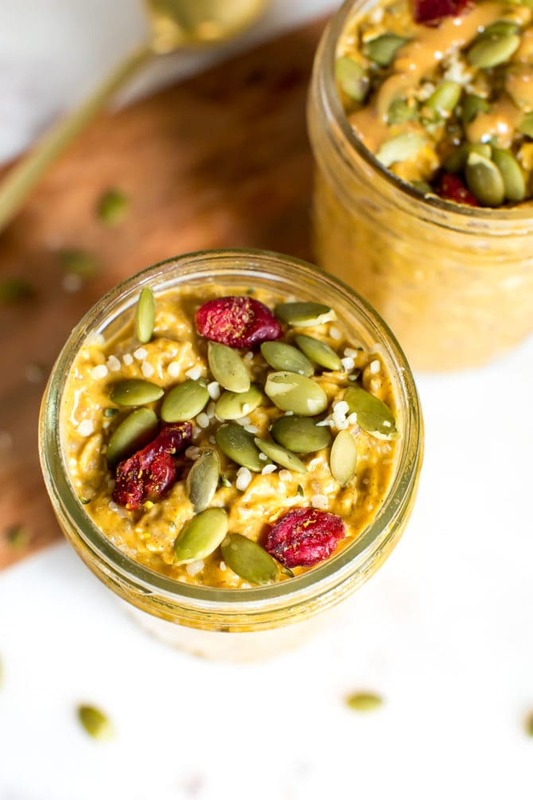 Have pumpkin pie for breakfast with this healthy pumpkin pie overnight oats recipe. It’s fast, easy, vegan, gluten-free and delicious! I hope you are ready for all things pumpkin because as you know, October is here and I’m obsessed. Call me basic if you want, but I love pumpkin flavored things (and I know many of you do as well) so let’s celebrate. And by celebrate I mean, enjoy as much pumpkin goodness as possible… without having our skin turn orange. 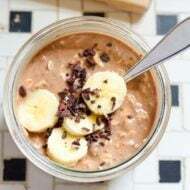 Most of you probably know what overnight oats are, but just in case we have some newbies, here’s a simple explanation — overnight oats are simply plain rolled oats (not instant) that soak up liquid overnight in the fridge. You can use any type and combination of liquid/wet ingredients you like. My favorite is unsweetened vanilla almond milk, coconut milk and/or Greek yogurt. For this particular batch I’m using almond milk and canned pumpkin for my wet ingredients. After letting the oats soak up the liquid overnight (or a few hours if you’re pressed for time) you’re ready to eat. You take the oats out of the fridge, give them a good stir, top with your favorite toppings and enjoy. There’s no cooking involved! 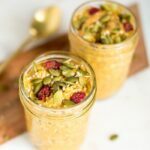 This particular overnight oat combo is one of my absolute favorites! I basically wait all year for it. 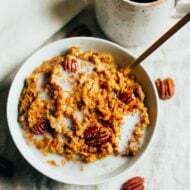 Pumpkin puree, pumpkin pie spices and almond milk give the oats a creamy texture and fall flavor that I love. If I’m craving more protein I’ll add a little protein powder or Greek yogurt to the mix but I don’t always find it necessary — especially if I’m adding pepitas (raw pumpkin seeds) and hemp seeds as a topping. The add ins and toppings are totally customizable so feel free to experiment with what works for you! Eating something that tastes like pumpkin pie for breakfast is an amazing way to start the day. Seriously, you have to try it! 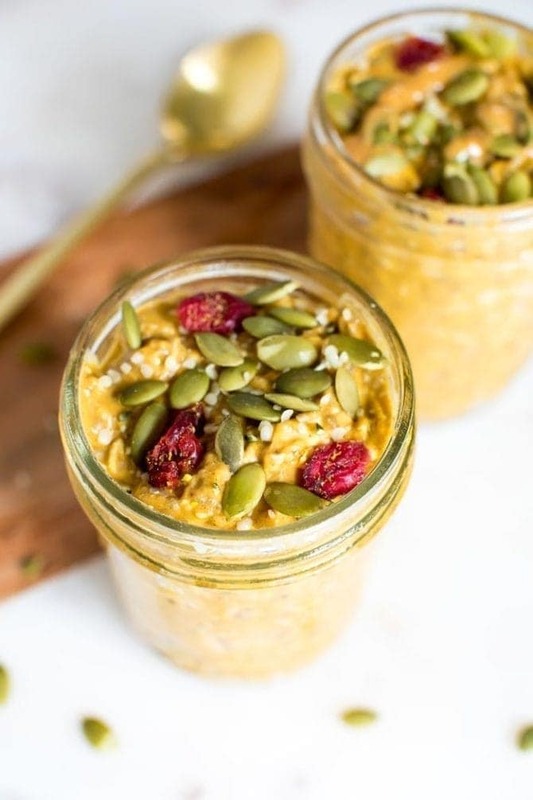 Short on time or forgot to prep your overnight oats? I’ve got you covered… make this pumpkin pie smoothie instead! 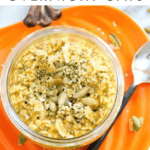 If you make these pumpkin pie overnight oats be sure to leave a comment and star rating below letting us know how it turned out. Your feedback is so helpful for the EBF team and our readers! Combine all ingredients in a bowl except the hemp seeds and pepitas. If you’re using Greek yogurt or protein powder, add that in now. Take the mixture out of the fridge, stir and sprinkle on hemps seeds and pepitas. Feel free to add a scoop of almond butter or an extra drizzle of maple syrup before serving if you’d like. Are you a pumpkin lover as well?!? If so, what’s your favorite pumpkin dish to make this time of year? Definitely do a jeep tour in Aruba! You get to see SO many awesome things around the island that are unique. Completely worth it. P.s- can’t wait to try this recipe! Bring on all the pumpkin. Yum! What are the nutrition stats? Doesn’t look like they came though in the post. Hi Cindy. Sorry about that — I don’t know what happened to the stats. Just added them again. Good luck with the packing! Aruba will be worth it though. 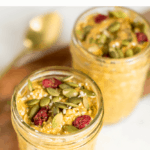 Love this overnight oats and all the seeds you added. Yum! Yay! So happy you’re on-board with the overnight oats now. I’ve made them with steel cut oats before too and I really like the extra chewiness. Thank you, Beverley! I was so excited when I found this plate at Home Goods. 😛 I hope you get a chance to try the recipe! Where are you staying in Aruba? We were just there in July, we stayed at Bucuti and Tara and it was fabulous! I highly recommend going on one of the snorkeling tours- we went on a 3 stop catamaran one and it was amazing! We also went on a horseback tour to the Natural Pool which was great, so if you like/think you will like riding horses you may want to try it. There’s a great restaurant called the flying fishbone that you can sit with your feet in the water at sunset, fun and great food! We’re staying at the Divi Resort an it’s our first time so your suggestions are really helpful. I definitely think we’ll do a couple snorkeling trips and we’ll look into the horseback ride as well. Thank you!! 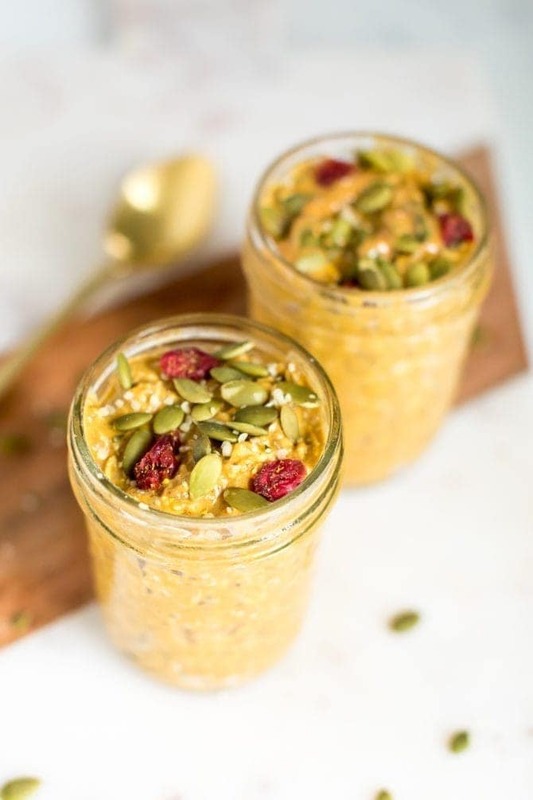 These oats look so yummy – can’t wait to try them! Have dinner at Passions on the Beach if you have the time. The food and atmosphere was so wonderful – a meal highlight of our trip. If you return on a weekend day – be sure to get to the airport at least 3 hours early. You clear US Customs in Aruba and the lines are very long. Have a great trip! Thanks so much for all the suggestions Susan! We do come home on the weekend so we’ll make sure to get to the airport early. I’m a huge overnight oats fan! 🙂 Yum! And i love that pumpkin plate! so cute! 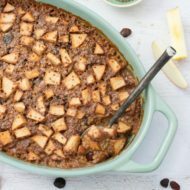 Thanks for all of the amazing recipe posts! I just found your site, and I feel like I’m saving every one of them to try later! I made this recipe last night and I just had it for breakfast. Wow! It feels like Thanksgiving in July. What a delicious breakfast! Love that you added in so much texture with those pepitas, hemp and chai seeds! Can they be wormed up in the morning? Will it taste right? I prefer warm oatmeal but not if it’s going to “mess it up” ? 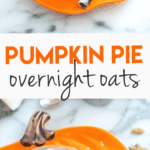 I’ve seen overnight oatmeal recipes… and this one sounds yummy. So… do you eat them cold? I kinda like warm oatmeal and am not sure about cold.